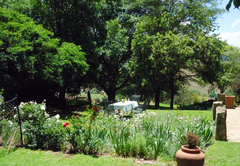 Bethel Lodge is a property providing self catering in Clarens for up to 8 guests visiting the Thabo Mofutsanyana region. 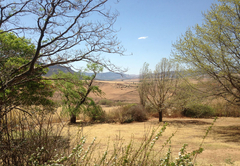 Bethel Lodge is situated on the Bethel Farm Estate just outside Clarens, The house has spectacular, uninterrupted mountain views. Waking up to a rising sun over the Maluti Mountains, there are views of the Golden Gate National Park which is only 15 minutes’ drive from Clarens. At Bethel Lodge, situated 4km outside of Clarens, you’ll find yourself in the midst of pristine nature; a restful place, home away from home, with the choice of long or shorter walks around the area, you will leave feeling refreshed after a stay at this establishment. 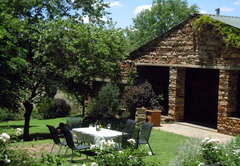 Bethel Lodge is the original sandstone farm house of Bethel farm, which has been modernized and prepared for comfortable self-catering accommodation for six guests. 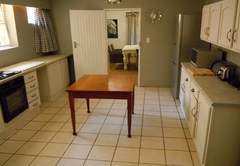 It is situated in a large garden with views of the Maluti Mountains and Mount Horeb which looks over Clarens. There are three well-appointed bedrooms, all east-facing to capture the mountain views and morning sun. 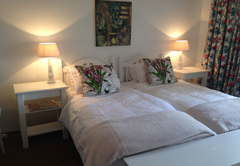 Two of the bedrooms have twin beds, with built in cupboards, white linen and electric blankets and towels. 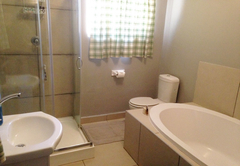 A shared bathroom with bath, shower and toilet, services these two bedrooms. There is an additional separate toilet. 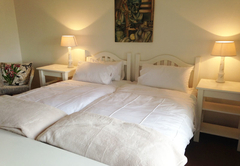 The master bedroom has views of Horeb, a queen size bed, built in cupboards, white linen, electric blankets and towels. An en-suite bathroom with an oval bath, shower and toilet completes the picture. 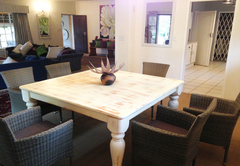 The living area of the house is large comfortably furnished lounge and dining room. There is a large flat screen TV with the Premium DStv bouquet. A wood burning, open fire place has been fitted for those cold wintery days. 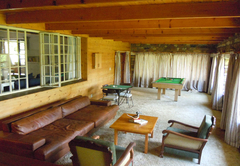 Adjacent to the lounge there is a separate games room, equipped with a billiard table. 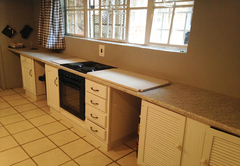 Entering from the dining room, a spacious family kitchen is fitted with fridge / freezer, microwave, kettle, toaster, electric hob and under counter oven, and enough crockery, cutlery, and cooking utensils to prepare meals for a large family. 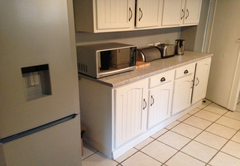 There is a separate pantry and scullery area. Leading outside from the lounge and dining area, there is north facing patio complete with patio furniture and a Weber braai. In winter, with the sun dipping slightly lower on the northern horizon, the patio becomes a wonderful suntrap for lunchtime and early evening braais. A large garden surrounds the house with parking for 3 cars under the shade of oak trees next to the house. 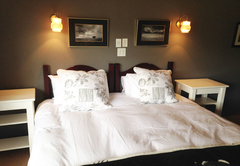 Bethel Lodge is the original sandstone farm house of Bethel farm, which has been modernized and prepared for comfortable self-catering accommodation for six guests. 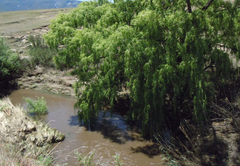 It is situated in a large garden with views of the Maluti Mountains and Mount Horeb which looks over Clarens. 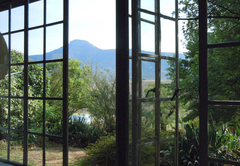 There are three well-appointed bedrooms, all east-facing to capture the mountain views and morning sun. 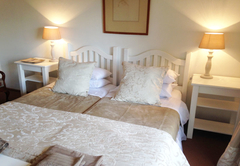 Two of the bedrooms have twin beds, with built in cupboards, white linen and electric blankets and towels. 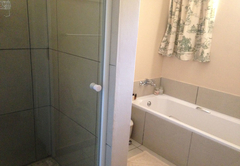 A shared bathroom with bath, shower and toilet, services these two bedrooms. There is an additional separate toilet. The master bedroom has views of Horeb, a queen size bed, built in cupboards, white linen, electric blankets and towels. An en-suite bathroom with an oval bath, shower and toilet completes the picture. 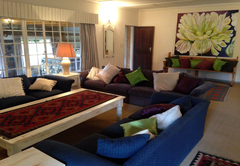 The living area of the house is large comfortably furnished lounge and dining room. There is a large flat screen TV with the Premium DStv bouquet. A wood burning, open fire place has been fitted for those cold wintery days. 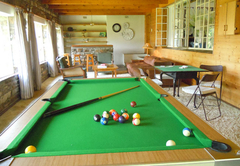 Adjacent to the lounge there is a separate games room, equipped with a billiard table.